A "game-changer" was how a Filipino security expert described the Philippines' decision to challenge Beijing's claim over nearly 90 percent of the West Philippine Sea (South China Sea). And a decision by the international tribunal would serve as benchmark in settling international maritime disputes, said Prof. Chester Cabalza of the National Defense College of the Philippines. But what happens if the ruling, expected to come out next year, does not favor the Philippines? 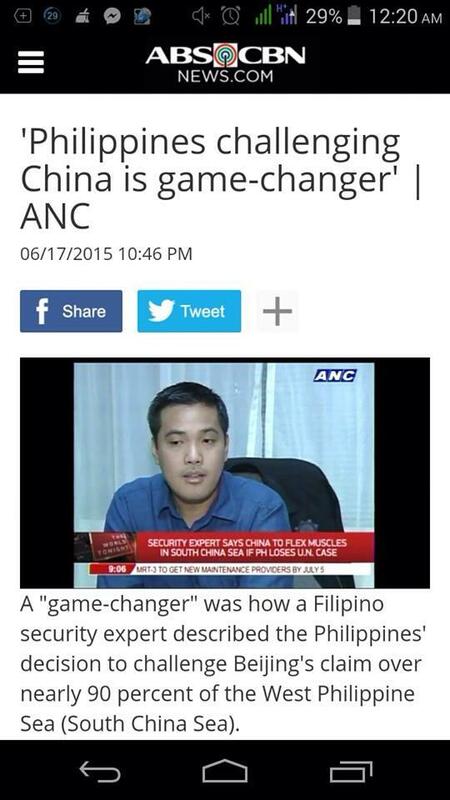 It could likewise be "game-changing," Cabalza said, "in terms of the security environment in the Asia-Pacific." "If we lose the case, (then) it’s going to be a new era for China. Definitely, they will flex their muscle," he told ABS-CBN News. “(But) in the remote possibility that we lose in the arbitration, then we have no choice. We have to look for another solution and maybe drastically sit down with the Chinese,” Lozada said. Lozada, a China expert who also served as foreign affairs adviser during the Ramos administration, said the government should explore bilateral talks with China over Panatag Shoal (Scarborough Shoal). “On the part of the Scarborough, it is a bilateral problem between us and China. I say bilateral because it’s a common problem between the two countries,” he said. Cabalza said there’s no harm in a bilateral approach despite the existing arbitration case. Lozada acknowledged that bilateral talks with China on Panatag at this time would not be easy, especially with the impression that the United States is meddling too much. He said such talks could still involve the U.S. and other Southeast Asian neighbors as observers. Lozada is optimistic Manila and Beijing could sit down, despite their raging word war, especially when China began reclamation activities in the Spratlys. “We can just really erase everything and start anew,” he said. The Philippines occupies eight islands in the Spratlys, namely: Kota (Loaita Island), Lawak (Nansham Island), Likas (West York Island), Panata (Lamkian Cay), Pag-asa (Thitu Island), Parola (North East Cay), Patag (Flat Island), and Rizal (Commodore Reef). China’s reclamation activities cover Burgos (Gaven), Calderon (Cuarteron), Kagitingan (Fiery Cross), Mabini (Johnson South), McKennan (Hughes), Panganiban (Mischief), and Zamora (Subi) reefs. Magdalo Rep. Francisco Ashley Acedillo said the Philippines could talk with China at “lower levels” like on matters such as trade and cultural exchanges. At the very least, Lozada said Beijing and Manila could “agree to disagree” on Panatag. That may not sound much, but in foreign diplomacy, that could go a long way.